Congrats to the authors of the SfN posters we recently saw using IC on their fascinating work! What is this analysis method? This toolbox lets you run Informational Connectivity (IC) on your own fMRI data. IC brings together Functional Connectivity and multi-voxel pattern analysis (MVPA) to identify brain regions that have synchronized changes in multi-voxel pattern discriminability across the timeseries. A seed region's MVP discriminability is first calculated for every time-point, producing a timeseries of values reflecting the ebb and flow of multi-voxel information. The equivalent timeseries of MVP discriminability is then calculated for other regions (either pre-specified or through an exploratory searchlight). 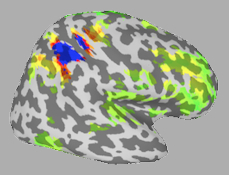 Just as Functional Connectivity can be measured by correlating regions' activation levels over time, Informational Connectivity is calculated by correlating the changing levels of MVP discriminability across time, allowing investigators to discover networks of brain regions that share synchronized multi-voxel pattern decoding. The method is described with full details in Coutanche & Thompson-Schill (2013). 1) The absolute minimum requirement is to have Matlab installed. 2) If you don't already have your data inside Matlab, you should also install the free (and excellent) Princeton MVPA Toolbox, which includes tools for bringing fMRI data into the Matlab environment. The IC Toolbox comes with a script that will convert any data held inside the Princeton toolbox to the right format for IC. Most people will probably want to first run 'import_from_mvpa_toolbox' to get their data ready, and then 'exploratory_IC' or 'run_ROI_IC' for the actual analysis. Type: "help import_from_mvpa_toolbox", "help run_exploratory_IC" or "help run_ROI_IC" for details on each script.